Take your health to new heights by including more hemp seeds in your diet! If you haven’t brought hemp into your kitchen yet, it’s high time (no pun intended) you did. Hemp seeds, also commonly called hemp hearts, have an almost habit-forming nutty taste that can kick up any meal or snack. And they’re loaded with must-have nutrients that can take your health to the next level. Once as hard to track down as a snow leopard, hemp-based foods have become increasingly popular and easier to find than ever. Here’s what they have to offer. Hemp seeds are fatty, but in a good way. Roughly 77 percent of their total fat is made up of polyunsaturated fats, specifically alpha-linolenic acid (an omega-3 fatty acid). This “healthy” fat plays a major role in supporting heart health, immunity, and cognitive function. A recent study also found that substituting about 100 calories of unsaturated fats, like those found in hemp, for 100 calories of carbohydrates and saturated fat in a daily diet may help support blood-glucose control. Each 2-tablespoon serving of hemp seeds supplies 7 grams of protein—nearly twice the amount found in the same serving of flax and chia seeds! And hemp seeds are also considered a complete protein with all nine essential amino acids (although they contain very little lysine and are relatively low in leucine). Beyond providing protein to build new muscle mass, hemp seeds contain lots of fiber, antioxidants, and minerals to support heart health. Seeds are the beginnings of plants, so it makes sense they contain a wide range of nutrients necessary for growth, chief among them being iron, an essential mineral that helps transport oxygen throughout the body. A 2-tablespoon serving of hemp seeds also provides almost half of the minimum daily requirement for magnesium. Surveys suggest that many people aren’t getting enough magnesium in their diets. [4,5] Hemp seeds provide a convenient, diet-based way for people to meet their daily magnesium requirement. The seeds are also a good source for dietary phosphorus and zinc. The easiest way to add hemp seeds to your diet is just to sprinkle them on your oatmeal, yogurt, and salads or blend them into protein shakes. If you’re a little more ambitious, try one of the following recipes. If you want to step up your pesto game, swap out those pricey pine nuts for hemp seeds to make a delicious, nutty spread to add to sandwiches. The pesto can be kept in the fridge for up to five days. 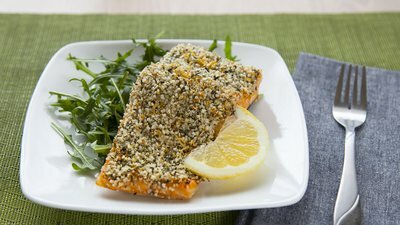 Hemp and salmon team up to create a dish that contains a boatload of mega-healthy omega-3 fats and muscle-sculpting protein—just another example of how you can slip ultra-versatile hemp seeds into any meal for a nutritious boost. Wake up your breakfast routine with this crunchy, creamy dish—also perfect for post-workout nourishment. Homemade granola usually has to be baked for a long time, but this stovetop hack cuts down the time to almost nothing. Del Gobbo, L. C., Imamura, F., Aslibekyan, S., Marklund, M., Virtanen, J. K., Wennberg, M., ... & Fretts, A. M. (2016). Omega-3 Polyunsaturated Fatty Acid Biomarkers and Coronary Heart Disease: Pooling Project of 19 Cohort Studies. JAMA Internal Medicine, 176(8), 1155-1166. Imamura, F., Micha, R., Wu, J. H., de Oliveira Otto, M. C., Otite, F. O., Abioye, A. I., & Mozaffarian, D. (2016). Effects of saturated fat, polyunsaturated fat, monounsaturated fat, and carbohydrate on glucose-insulin homeostasis: a systematic review and meta-analysis of randomised controlled feeding trials. PLoS Med, 13(7), e1002087. Song, M., Fung, T. T., Hu, F. B., Willett, W. C., Longo, V. D., Chan, A. T., & Giovannucci, E. L. (2016). Association of animal and plant protein intake with all-cause and cause-specific mortality. JAMA Internal Medicine, 176(10), 1453-1463. Sarrafzadegan, N., Khosravi-Boroujeni, H., Lotfizadeh, M., Pourmogaddas, A., & Salehi-Abargouei, A. (2016). Magnesium status and the metabolic syndrome: A systematic review and meta-analysis. Nutrition, 32(4), 409-417.